Submitted by Simon Coleman on Sun, 17 May 2015 - 11:08. This pump does not always need priming, i would recommend trying the pump first and if it feels very light then there is no water in the cylinder and therefore you will need to follow the priming process. To prime the pump you need to pour water into it. There is a glass bottle by the water barrel, fill the bottle and pour the water into the top of the pump where there is a little slot. Once the water pours out of the spout then there is enough water in the cylinder. Pump briskly a few times then you should feel the pressure change from the suction of the water in the well. Installation work on this pump started in late April 2105.The plot holder Helene informed me of the well on her plot. The well was hidden under an old water tank. The first thing i did was to check the condition of the well. The well was constricted using metal barrels one on top of another. The well top was a standard man hole cover not more than twenty years old. The well was most likely made safe by "Vic" the previous maintenance man on the allotment. He had told me he had put man hole covers on wells. There was a small amount of debris in the bottom of the well, two pieces of wood and a small table top these items turned out to be too difficult to remove and were left to decompose in the future. The next stage was to construct a concrete base for the wooden well top to sit on. The concrete base gave the opportunity to bolt the wooden top securely to the ground. The well top was constructed of a reclaimed ceiling joist 7" x 2.5". This wood was thick enough to support the wait of the dip tank that would sit on it when completed. The pump itself sits on a fixed section of the wooden top while other section of the top is made as a single top and is removable (although bolted down) allowing access to the well for maintenance. The pump is a standard "village style" pump made of cast iron with a cast iron base. 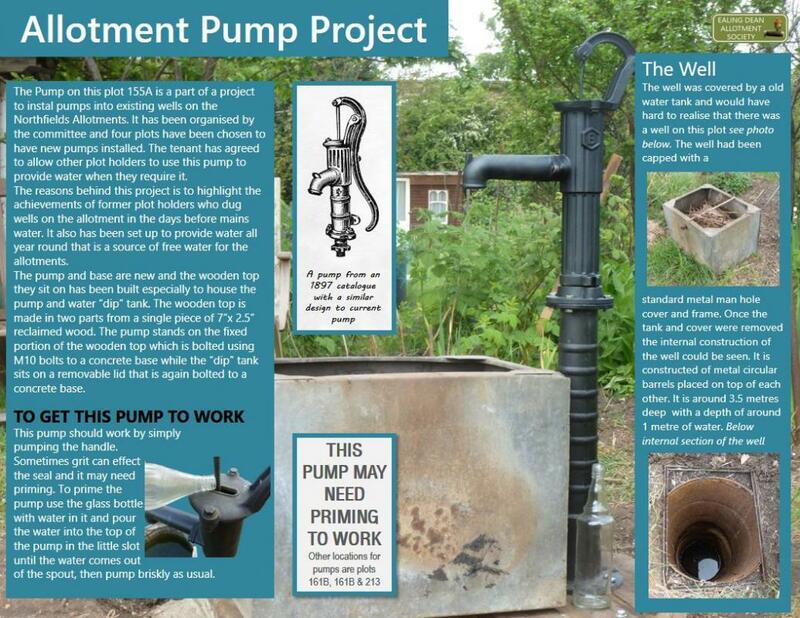 The pump and stand are new and purchased by the committee as a part of the project. The pipe work that connects the pump to the water is plastic 32mm pipe with a 90 degree turn on the bottom to avoid sucking items up from directly from the bottom of the well. This well is for everyone to use if they need water but also you can visit the pump just to "have a look" for your personal interest.